Global Supply Chain News: Is the Cheap Chinese Labor Party Quickly Coming to an End? Global Supply Chain News: Is the Cheap Chinese Labor Party Quickly Coming to an End? Global Supply Chain News: Is the Cheap Chinese Labor Party Quickly Coming to an End? Strike at Honda Plant in China – though Technically Illegal – Shows Changing Wage and Social Policy Dynamics; How Big will Wages have to Rise for Companies to Source Elsewhere? As wages rise, many manufacturers will look to Western China or other Asian country such as Vietnam or the Philippines for even lower wages, which could have an impact on China’s economic growth and employment. The rapid rise in manufacturing wages in China took a brief respite with the start of the global recession in 2008, but as China’s stimulus fed expansion quickly took hold, once again wages are on the rise – as well as labor activism. What does it all mean? That is difficult to say, but the seeming general acquiescence of the Chinese government to the moves suggest it’s long planned strategy for competing other than by low wages is advancing to its next phase. The symbol for this changing dynamic is clearly the current strike at Honda’s massive transmission plant in Foshan, China, in the Guangdong province, involving nearly 2000 mostly young workers who have been on strike since May 21. 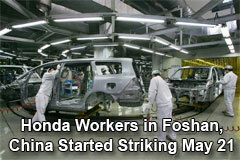 The strike has shut down auto production at Honda’s four Chinese assembly facilities for now. While word today is that a resolution to the labor conflict may be over, that is happened at all is telling. Strikes are now allowed in China, by custom, but it is not clear if there are any actual laws banning strike activities. The strike highlights in part the growing income disparity and inconsistency in China. Workers at the Honda factory make about $150.00 monthly in US terms, whereas in many other parts of China, similar manufacturing workers take home about twice that per months. At the Honda factory, that $150-200 per month currently requires 10-12 hour days, six days per week. According to reports today, almost all of the striking workers have agreed to an increase in the total starting wage by about 24 percent to now about $280 per month. However, there were also reports of minor fighting between local police guarding the plant and some of the workers on Monday. Workers also have complained about a lack of air conditioning in the plant, as well the fact that they are forced to rise at 5:30 a.m. at the worker dormitory for a shift that starts at 7:00 a.m. The workers additionally get free lodging and subsidized meals in the dormitory – but sleeping with 4-6 per room in bunk beds is not exactly easy living. As China’s middle class grows, that kind of lifestyle and low wages are meeting increasing resistance – which ultimately will drive costs back into products being manufactured there for export back to developed markets. What has been highly interesting to most observers there is that the strike is taking place with little interference from the Chinese government, which not only has made no moves to stop the strike effort, but is initially allowed state media to provide high levels of television and Internet coverage of the labor action. That is significant because it obviously sends a message about striking as a tactic to laborers all over the country. Though some believe that the government is taken a low posture approach because Honda is a Japanese company, and there is bad will in China towards the Japanese dating back at least to World War II, the Chinese government has to know it is letting something of a cat out of the labor bag no matter what company is experiencing the strike. There are many unions in China, but their role is generally one much different than that found in most developed economies. The unions are usually state-controlled, and play more of a management role in overseeing workers, not bargaining for higher wages or improved labor conditions. Labor organizing outside the government-controlled All China Federation of Trade Unions and company branches of the ruling Communist Party is illegal. At the Honda plant, the union is said by the strikers not to be representing them, but rather playing something of an intermediary role between the factory and the employees. But clearly labor activism has increased in China since it passed the Labor Contract Law in 2008. That law in part set standards for labor contracts, use of temporary workers, layoffs and other areas of company-worker relations. It also had the effect of raising the awareness of workers as to their legal rights. According to the Associated Press, since the law’s passage, sit-ins and other protests are common in the In the Yangtze River Delta region, near Shanghai, though rarely reported in the state controlled media. That’s why the initial extensive coverage of the Honda strike is so interesting. Wages have been on the strong rise in China for quite some time, and those companies complying with the new labor law can see their costs rise by as much as one-third versus before. As the Chinese economic recovery proceeded ahead of the West, labor shortages, especially near Shanghai, have once again started to appear, pushing labor costs up and in some cases likely giving confidence to labor protestors or maybe now even strikers. More than 90 percent of companies based in China’s Pearl River Delta region, which includes Guangzhou, reported labor shortages, adding up to about 2 million workers, China’s Southern Metropolis Daily reported recently. However, prices, especially for real estate, are also spiraling in China, and most workers find even the increases they have been getting in recent years are not keeping pace. Some say the Chinese government recognizes this dilemma and hopes to build more organic strength in its currently export-driven economy, and is therefore being more open to labor action than it ever has until now to increase domestic spending power. But as wages rise, many manufacturers will look to Western China or other Asian country such as Vietnam or the Philippines for even lower wages, which could have an impact on China’s economic growth and employment. Still, China may be betting that the attractiveness of its rapidly growing domestic market for its 1.3 billion people and its ability to drive low costs in more value-added product categories will take up and slack from losing jobs making commodity products to even lower cost countries. What are you seeing in terms of Chinese labor costs? Do you make much of the Honda strike action? Do you think China can smartly navigate the transition to more higher value products and keep its export machine going even with rapidly rising labor costs? Let us know your thoughts at the Feedback button below.